Sometimes a long stretch of time between two horrible moments can transpire in a rapid flash (at least if they are planned for). A good year or so went by between the arrival of the first and second “Purge” movies, but I would wager that our fearful anticipation could never match that of the characters, many of whom are not so much witnesses to dreadful realities as they are victims earmarked for extermination. For them, a year must move by in a blink of awareness. That’s because they occupy space in a world where the politics of power forces are interlaced with the cruelest (and most narrow) perspective of Darwinian superiority. Every year, on one night for a straight 12 hours, the “New Founding Fathers” of America commence the annual “purging,” a nationwide ceremony in which all crime is legalized and ordinary people are given the opportunity to “free the beast” from within, assuming they aren’t killed by someone else possessing an even more bloodthirsty urge than their own. What that means – at least in the movies – is that the human race becomes a living example of corruption in action. Who are the ones who take advantage of their rights? Who is more successful? In a world landscape where lower income classes are circumvented by the pull that comes with having money, the rich must become the target of study in a picture like this, otherwise there is little need to ponder how else a situation like this might play out in a genuine civilized society. If money is the root of all evil, then James DeMonaco’s “The Purge” emphasized that in a cinematic argument that was persuasive, shocking and effective in the way it brought us toward the edge of psychological impact. Now comes “The Purge: Anarchy,” which tells a similar story in a very direct context exactly one year later, all while ramping up the adrenaline while a cluster of bystanders are united in the streets during the open warfare of Purge night. Some of them are brought there by accident, others by setup; when they unite, they proceed on a mission of survival that will ultimately take them through subplots aplenty, and moments where friends are betrayed, ambushes are likely and chases inspire hair-brained decisions that cause them to fall into even bleaker realities in the hands of sadistic villains. Or, in the more familiar traditions of movie sequels, we get a lot more of the same old thing. The most significant departure is in the characters, none of whom are carry-overs from the first picture (a big violation of principles for sequel continuity, mind you). The featured player is Eva (Carmen Ejogo), an unassuming diner waitress who is at the end of her shift and ready to rush off home to go on lockdown for Purge night. She and her teenage daughter Cali (Zoe Soul) are not exactly the top of the income bracket, and that prospect is emphasized in two ways: with the setting of a fairly tiny apartment in the heart of Los Angeles, and with the presence of a father who is sick, dying and costing them significant time and money. In the backdrop, meanwhile, their safety is undermined by a moment of strategic foreshadowing; Eva is offered a night’s safety from a brutish male neighbor who leers over her with predatory yearnings, and her decline of his advances is met with a gaze that suggests lethal confrontations later in the night. Meanwhile, a young couple banter back and forth in a grocery store somewhere in town, arguing about whether they should inform relatives of their impending breakup. They are Liz (Kiele Sanchez) and Shane (Zach Gilford), an attractive pair that seem oblivious to the evening’s events until they run into – quite literally – a street gang near their car in the parking lot. The scene in which they exchange silent gazes is an effective conduit for tension; with their painted faces and ominous masks, one does not know their true intentions but suspects that it will all lead to something dangerous and destructive for the others. That reality is realized when both of them, still arguing in the car in between laughing about memories, are stranded on a bridge after their car completely dies, and the gang eye them from a distance like vultures circling impending corpses. The plot will demand both pairs to meet up inadvertently as they are subjected to victimization at the hands of purge participants, all while a mysterious man in a dark car (Frank Grillo) jumps to their defense during a moment when it looks as if Eva and Cali will be shot down in plain view on the street. Their alliance is an uncomfortable one; he is armed to the teeth and seemingly fearless of the dangers lurking all around him, and yet his deadpan demeanor does not restrict him from generous impulses. Why did he save them when it seemed so clear that he was off on his own agenda? Where did he muster up the bravery to be out all night? Is he hiding secrets that could undermine the safety of his own group? The movie is good at suggesting possibilities without exposing motives, and perhaps that’s a necessity; Grillo plays the character with such effective mystique that a more exposed character would have been out of synch with the portrayal, and probably destructive to the plot’s methodical tone. Like all follow-ups, of course, there are additives in the margins. As the five critical survivors pass through the night hoping to go undetected, their unease is amplified by the circling of very organized groups of criminal minds – some on foot, others in big rigs or on motorcycles. When they try to escape a series of deadly shoot-outs by stealing the van of a skilled sniper, they discover an interior filled with working traffic cameras – an epiphany for most, because such technology isn’t really available to the general public, even in this particular movie world. And then, as the title ought to imply, there are vague hints of uprising going on in the background; a group of impoverished rebels are seen in random video feeds broadcasted on billboards and the sides of buildings, where a man (looking curiously like Malcolm X) promise a revolution against the wealthy paradigm that has created such a ghastly annual tradition (“Tonight, we write our message in blood – their blood!”). Director and writer James DeMonaco, who also did the first picture, validates his film by actually contemplating the social ramifications of these ideas. They don’t just exist for the sake of inspiring violence or mayhem, and at some point most audience members will be genuinely inclined to wonder just how they too would feel being trapped in a world with such corrupt moral values. 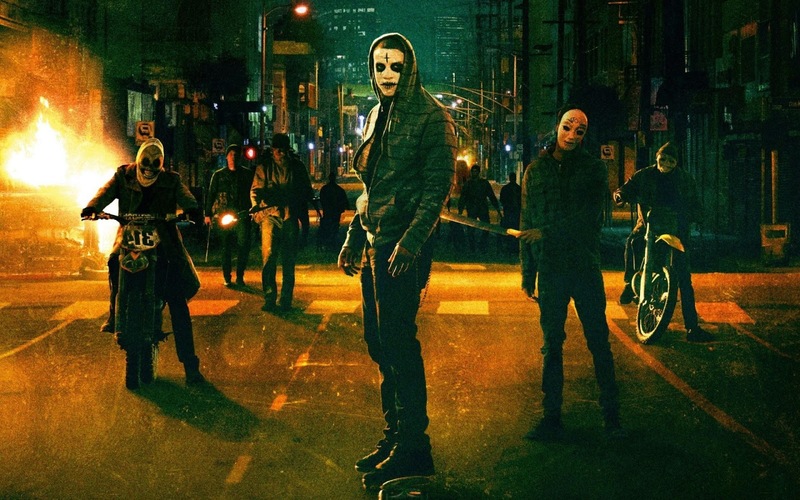 The problem with “The Purge: Anarchy,” alas, is that it doesn’t bring all of its points together in a cohesive argument. Though many of the characters come together for one viable purpose, many of them have motives that aren’t realized fully, and often we forget who is who in a game where everyone is required to rush through shadowy alleyways to escape this gang, that gang… or whoever else is out freeing the beast in that specific moment. More factions emerge in the wake of this plot than an episode of “Survivor.” And what’s worse, the movie meanders completely around its problematic challenges. There is a lot of dead space of people walking around and glancing at one another with silent gazes of anxiety. You would suspect intelligent conversations would be part of the equation in moments when the characters are allowed to pause, but no luck – usually their exchanges amount to unanswered questions or shallow exchanges (“I still need a car!”). And then, to top it all off, their climactic encounters with a street gang lead us into a resolution so utterly implausible that is an anti-climax, a violation of horror movie laws that should dictate situations to arise that don’t seem like detached comical fantasies. And don’t even get me started on the preposterous diatribe of the last five minutes involving a gun-toting government official, who reveals new secrets in a key moment of confrontation that, realistically, shouldn’t be all that secretive (at least to anyone paying simple attention). The movie at least shows visual restraint. In a time when the living human body has been reduced to a hunk of ground meat running consistently through a machine of blades and bullets, how remarkable it is to see DeMonaco not go over-the-top in his gore factor. The movie is certainly violent – with plenty of shootouts and blood splatters – but none of it is gruesome or revealing enough to cause turned stomachs, and for most of the duration we feel as if we are simply watching a well-staged crime thriller. I applaud any filmmaker who uses the act of carnage as a statement rather than a necessity in making some kind of point. His problem is that he has just made this particular point before, and with much more clarity; while the first “Purge” picture was a melting pot of dangerous ideas, it suggested them with singular intentions and never lost its way. I admired that film, even though I felt uneasy and distressed well after it was over. “The Purge: Anarchy” certainly has its heart in the right place, but the noise of the peripheral keeps us from penetrating to the core of any perspective it hopes to have. Does it continue to detest the actions of the rich? Does it hope to suggest that uprisings are always possible? Are we destined to fall victim to the beast as much as we might protest the mayhem that comes with it? Perhaps it’s fitting that the word “Anarchy” is in the movie’s title: it implies all that is necessary in describing such a disorderly narrative.